Being fashionable and stylish becomes all the more interesting and redefining when there’s a fun way to do that. Built on the premise that there’s a fun side to everyone, the entire range of clothing by Bumchums has been designed with the sole purpose of making you look cool, smart and trendy. A leading apparel brand, Bumchums is also about choosing a unique blend of designs and fabrics that offer the utmost comfort and allow for a refreshing and relaxing experience. Moreover, Bumchums offers a wide range of shades and styles so that you can choose the best fit to suit your unique tastes and preferences as well as find the perfect match for specific occasions. With Bumchums, you can make a style statement like none other, all while ensuring that it’s all good fun and playful. Bumchums offers a comprehensive range of trendy clothing for tiny tots, teenagers and grownups. Let’s take a look at some of the most exclusive Bumchums clothing collectionsavailable under the men’s category. Bermudas – Bumchums Bermudas are the ultimate in style and comfort. They are just perfect for every informal occasion and help you showcase your trendy streak in life. These are also a great sporting accessory. The Bumchums Stylish Plain Bermudas offer the next level in comfort, as they are made from 100% cotton. You can choose from a wide range of assorted colors, look cool and display your playful side. There’s the 1156-New Stylish Printed MercerisedBermudas, which are made from 100% cotton and are ultra-comfortable. These specialized Bermudas feature a contrasting multicolor dual neckline and come with striking designer prints. If you are looking for an ideal choice of Bermudas to have a fun day, you should check out the Bumchums Plain Bermudasthat offer superior comfort and look super cool. These are the best things to wear with a t-shirt. You will be spoilt for choice since these are available in a plethora of assorted colors. For poolside parties or beachfront fun time, you can choose Bumchums Designer Plain Bermudas that are uniquely trendy and comfortable. These come with contrasting stripes on the sides, making you stand out among the crowd. These too are available in assorted colors. 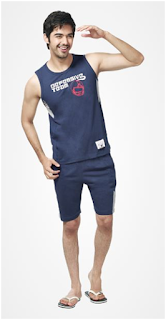 Loungewear – Bumchums Loungewear collection offers the trendiest choices in casual, comfortable clothing. These are excellent options for home, hangouts, holidays, sports, spending time at the local clubhouse, an evening stroll or just a walk down the road. Bumchums Stylish Plain Loungers offer the perfect combination of luxury and comfort. These feature a two-tone design, which makes them a great choice to go with a smart tee. If you are looking for style and comfort, you can choose Bumchums New Plain Loungers that are made from 100% cotton and come with distinguishablecontrast stripes. Another great way to have the best of both worldsis the Bumchums Stylish Capris. These capris are made from 100% cotton and feature contrasting dual side panels. These can be your perfect companion for an exciting day at the beach. Bumchums also offers the Sleeveless Set that comprises trendy sleeveless uppers paired with stylish shorts with contrasting side-stripes. Made from 100% cotton, these are the best choice for a day of relaxation or just chilling out anywhere on this planet. For your daily exercise routine or gym, you can choose Bumchums Round the Year Track Suits. These will get you noticed and its special stretchable fabric will ensure the most comfortable workout. T-Shirts – Bumchums T-Shirts offer varied choices and it depends on what style you would prefer on a particular day – funky, colorful, playful, classy, exuberant, flaunty, or just sober. You can choose from a wide range of options that include round neck t-shirts, stripes t-shirts, round neck printed t-shirts, double placket polo t-shirts, wash. These trendy Bumchums T-Shirts are available in assorted colors and most of them are made from 100% cotton, which provides for a comfortable, relaxing experience. You can mix and match and pair them with any clothing of your choice such as capris, beach shorts, jeans, track pants, etc.